What has been known for quite some time in nutritional science is that different foods and their balance will lead to different degree of malabsorption or good absorption of their nutrients by the cells in your body. 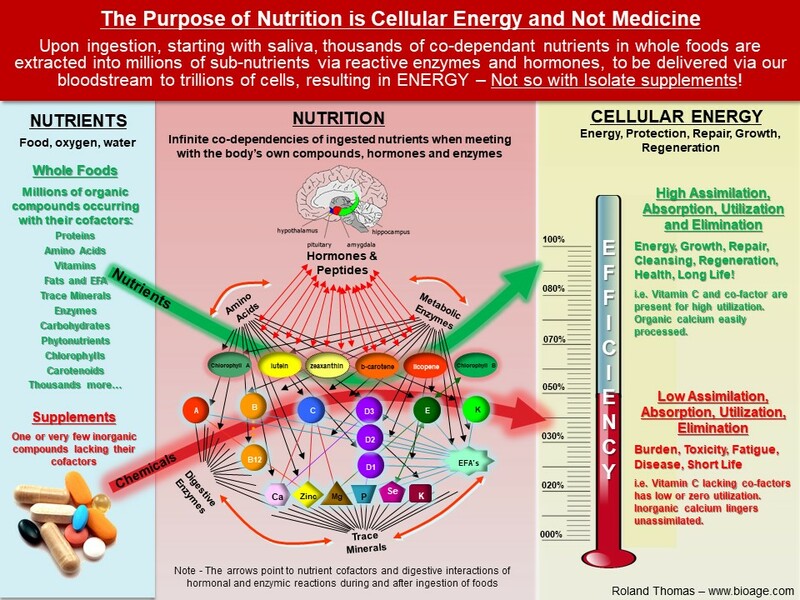 The major factor of this non-efficacy or efficacy is the balance between the various cofactors that accompany the nutrients in the foods – nutrient partners if you will – required for best assimilation and utilization of the nutrients/compounds we ingest. For example, the synthetic ascorbic acid compound was sold for decades as Vitamin C to millions of uninformed Americans. Gradually the veil was lifted as it was showed that this ascorbic acid was 100% inefficient and typically found expelled in your urine. The reason for this inefficiency is that synthetic and isolate compounds lack the cofactors required for proper acceptance, assimilation, and utilization of the compound (ie. ascorbic acid) by our cells. Gradually the vitamin C marketing machine added bioflavonoids or called it “natural” to maintain sales. Through many marketing reinventions, this artificial compound remains a hot seller. Yet as per unbiased research, isolate vitamin c has been proven at best to have moderate benefits, or to be mostly useless, and at times to be toxic. It is a statistical fact that millions of people taking a supplement of vitamin C, continue to get sick with flus, infectious diseases, fatigue, obesity, cancers, etc. What I mean by balance has to do with providing our body as best as we can with a balanced diet of foods – proteins, minerals, vitamins, fatty acids, carotenoids, chlorophylls, and many more phytonutrients, that will provide the nutritional efficiency needed for sustaining good health. I guarantee you that the best manner in which to obtain functional nutrients lies in consuming a mostly plant-based diet composed of many diverse greens, roots, nuts, and fruits, etc. This approach will easily deliver a more balanced set of functional nutrients without having to count calories, proteins, vitamins, omegas, etc., – thus freeing you from the current nutritionist model of measuring what you eat. This makes sense to you too I hope. Despite the popular notion that antioxidants, such as vitamins C and E, offer health-promoting benefits by protecting against damaging free radicals, a study in the journal Cell reveals that, in fact, nutrient balance is the key. Antioxidants in reducing oxidative stress are widely considered an important defense against heart disease. Oxidative stress is associated with a variety of deadly diseases, including heart disease, Alzheimer’s, and Parkinson’s. University of Utah researchers have found excessive levels of antioxidants was showed to reduce glutathione that may contribute to disease. In a study on laboratory mice, researchers found that an overload of antioxidants could lead to heart failure. Reductive stress is a condition caused by excessive levels of reductive glutathione, which is one of your body’s most powerful antioxidants. When your cells work properly, they produce just the right amount of reductive glutathione, which is healthy for your body. However, in some people, a mutated gene can disrupt the fine balance, causing the cells to produce too much. In this study, the researchers found that by lowering the level of reductive glutathione in mice with failing hearts, they were able to increase their rate of survival dramatically. In summary, this research and others show clearly that taking mega doses of any one antioxidant can lead to heart disease and even cancer rather then helping to prevent these ailments. It took over a decade of research by Michael Kiriac, N.D., PhD. to discover and ultimately deliver the properties of completeness, balance, and synergy in Bio-Algae Concentrates. For example, in Bio-Algae Concentrates we find several mixed carotenoids (antioxidants) occurring in the whole algae food in natural tiny amounts, safe and balanced for maximum synergistic effect in the body. This is in contrast to most supplemental forms of separate/isolate antioxidants that are most often synthetic. This is why whole foods and blended whole foods such as BAC are a much better and safer form of nutrients – the way nature designed it. 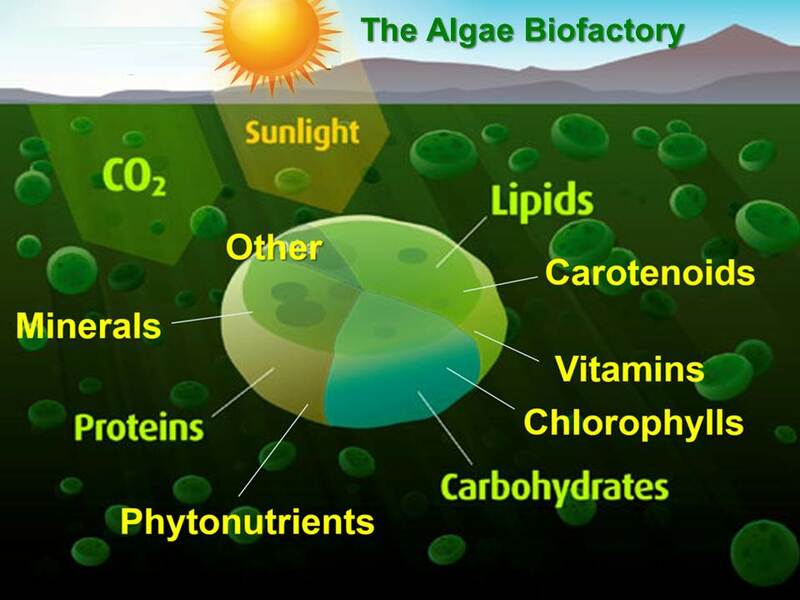 Of thousands of algae on earth, few are “human” friendly (as in nutritionally efficient). In the making of BAC, hundreds of algae where investigated; four (4) were selected for their individual and complementary value. Algae, like vegetables are only as nutrients rich as the soil/water/base in which they are nurtured; the best algae thrive near volcanic regions because of the abundance of minerals and trace elements brought to the surface during eruptions; The algae in BAC are nurtured in one of earth’s richest volcanic region. We have all heard the expression “the sum is larger then the summation of its parts” as in 1 + 1 = 3. This law of synergy applies well with foods and nutrition; for example, two ounces of alfalfa with a few nuts easily surpass a large meal of potatoes with a 12 ounces steak. In the microscopic world this law applies a thousand-fold. The synergistic values of the four algae of BAC when blended together result in “EXTRAORDINARY” nutritional efficiencies and nutraceutical power. By reaching and feeding the cells of the hypothalamus, BAC complements the whole rather then supplement specific symptoms or deficiencies. In the words of Michael Kiriac, “BAC awakens the genius within”. All known mineral and trace elements (over 100); such as calcium with an 80% net assimilation, zinc, sodium, iron, phosphorus and potassium, etc. In all of my years investigating algae, I do not know of any other algae products that has undergone such “in depth” research – for 15 years, Dr. Kiriac led hundreds of researchers investigating hundreds of different algae species and blends, testing them with hundreds of animal groups and several large field trials totalling over one million animals. For 22 years, Mr. Kiriac was the lead researcher and director of the effort to develop nutritional solutions to various diseases in the USSR. A pioneer, he is the author of many scientific papers and patents in the science and technology of growing and enhancing micro algae concentrates. 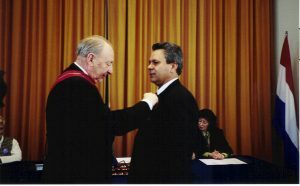 He is the recipient of gold medals for the invention of BAC and its use to help some victims of Chernobyl. Mr. Kiriac continues to lecture and promote nutrition all over the world to alleviate health conditions and problems. In 1985 Mr. Kiriac was nominated Moldova Person of the year for achievements in algae research and its local application resulting in the economic success of the poultry center for Moldova. Disclaimer: The Food and Drug Administration has not evaluated these statements. These statements or products are not intended to diagnose, treat, cure or prevent any disease.